In 2017 Governor David Y. Ige signed a Proclamation identifying October as Disability Employment Awareness month, and endorsed Hawai’i’s designation as an Employment First state. In this proclamation, Governor Ige encouraged all citizens of the Aloha State to fully participate in the workforce and bring their individual strengths and talents to augment Hawai’i’s business and industry. DeSean has been working at Delivery Hawaii, Inc. for two years. He is currently working 15-20 hours per week and loves the benefits that come with being employed. 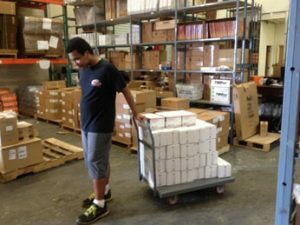 Through Individual Employment Supports an Employment Specialist assisted DeSean in making a connection with Delivery Hawaii, Inc. and met the owner, Ken Dawson. Ken could tell that DeSean would need some support but he would be “hard working and reliable”. Ken hired DeSean to work in the warehouse. DeSean also received Benefits Counseling from Work Incentive Planning and Assistance to see how his new income would affect his benefits. Benefits Counseling is now available through the Medicaid I/DD Waiver. DeSean soon realized that he needed more than just getting a job. He needed to be able to get ready for work, pack his lunch, and get to the worksite. DeSean still attended the ADH on the days that he did not work. 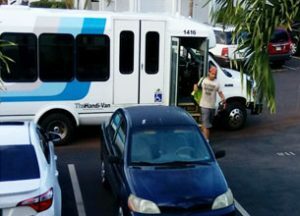 learned how to make his own transportation arrangements with the Handi-Van. DeSean’s mom helped him learn how to make his own lunch to pack for work. With Community Learning Service – Individual (CLS-Ind), DeSean learned to budget and purchase items he needs, as well as purchase his own Handi-Van tickets once a month. He now completes these tasks independently. When the Handi-Van service is experiencing delays, DeSean advocates for himself by requesting alternative transportation. 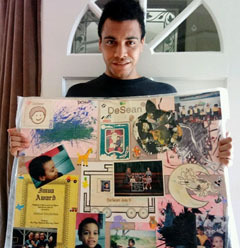 DeSean chose to no longer attend ADH because he wanted to establish a social valued role in the community. He wanted to spend time with people who shared his interests in sports and pursue his career options. 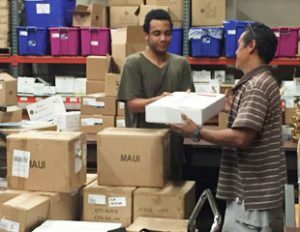 DeSean continues to be a valuable employee at Delivery Hawaii, Inc. The team that DeSean works with sees him as a co-worker, friend, and part of their family. If you have an employment success story and would like to share, please contact the Developmental Disabilities Division, Community Resource Branch at (808) 733-2134.